“The eyes are the window to the soul” is a popularised phrase, although its origins are unknown to us. With I Origins, writer and director Mike Cahill (Another Earth) tries to get a better understanding of said phrase, in a story about a small team of molecular biologists who search to uncover the secret of the human eye. The commonly accepted meaning of the phrase is a variation of this; by looking in to the eyes of a person, you can see their feelings, motivations and thoughts. Cahill seems to agree with this, but his aspiration to really understand the human eye – and our spices – does not end there. I Origins follows molecular biologists, Ian Grey (Michael Pitt), Karen (Brit Marling) and Kenny (Steven Yeun), in their workings to understand the evolution of the human eye. Their goal is to discredit creationists who says the human eye is proof of a divine creator, because even as Charles Darwin admitted; To suppose that the eye with all its inimitable contrivances…could have been formed by natural selection, seems, I freely confess, absurd in the highest degree. (read full quotation here). Ian Grey is of course interested in eyes, more so than most others, and likes to photograph them as much as possible. He meets a mysterious young woman called Sofi (Astrid Bergès-Frisbey) during a Halloween Party in a typical New York rooftop apartment. All but her eyes are hidden under a costume, and thus Ian asks permission to photograph them, something she grants him. They hook up in a broom closet just a few minutes later, but when Sofi leaves in the middle of the act, Ian is left alone, bewildered and full of questions about this mysterious girl, with eyes unlike any other. While his laboratory partners continue their research, he goes to look for these eyes, and they might just help uncover one of humanities big secrets. While the promotional material for the film tells a lot more, the whole film to be totally honest, I implore you to not read or watch anything else than I’ve stated about it above. It is a film filled with grandiose talk, from the purpose of scientific work to religion and spirituality, and while these thematic workings are riddled with pitfalls to pretentious filmmaking, Cahill has a great understanding of this. With his last film, Another Earth, which was co-written by Brit Marling, many people liked to critique it for being overly pretentious from start to end. I Origins never reaches the brilliance of Another Earth, and I believe this is because Cahill was to focused on these critiques. Pretentiousness has suffered a faith reminiscent of relatability in modern art criticism. I talk about the issue with demanding relatability from a film in our review of Whiplash, but when it comes to pretentiousness, many people seem to think it is exclusively bad. I believe that if the story is pretentious, pompous or grandiose of nature, the film-language should be allowed to reflect this, and Cahill is one of the few who manages to talk this language without becoming overzealous. 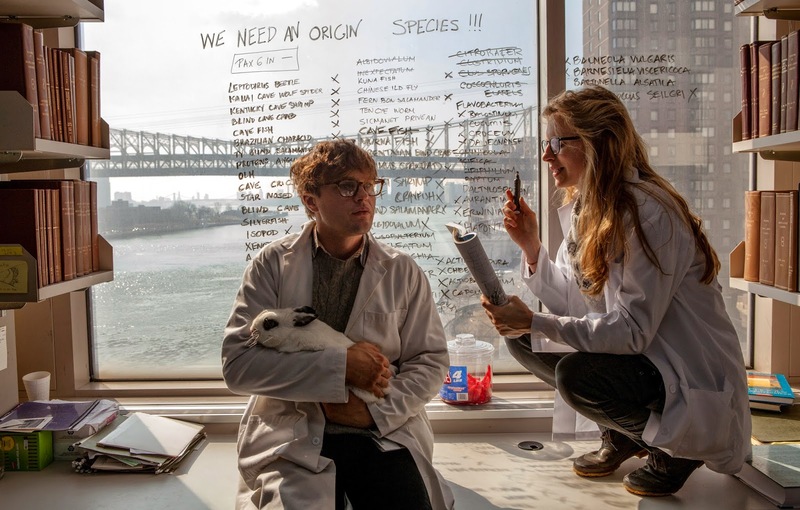 I Origins is however much more subtle than Another Earth, and could be described as a much more audience friendly film. He does take it to the next level in a few scenes, but for the most part it is very grounded. This could be the main factor in whether you will like it or not, but to me, it feels like Cahill is holding back the thing he does best. It must be said that the ending does cross the line in to cliché territory, and the film could have ended a little sooner – an open ending is nothing new to either Cahill or Marling as their filmography will attest to (I mean, have you seen Sound of My Voice? Pure genius!). With that said, a scene midway through the film is perhaps the most emotional one I’ve seen all year. The way it is shot by relatively unknown cinematographer, Markus Förderer is exceptional, and combined with Michael Pitt’s best on screen performance since Funny Games US, it hits hard. There is no doubt in my mind many people will dislike I Origins because it feels pretentious, but I believe Cahill pulls this of in a way few other directors do. Like Xavier Dolan has mastered pompous sentimentality (he really is the only one in cinematic history who does what he does), and Sofia Coppola has mastered contemplative character studies, I believe Mike Cahill is close to master the pretentious film-language. I Origins is truly a great film with a few downsides, but in all, a promising sophomore feature film for its director.